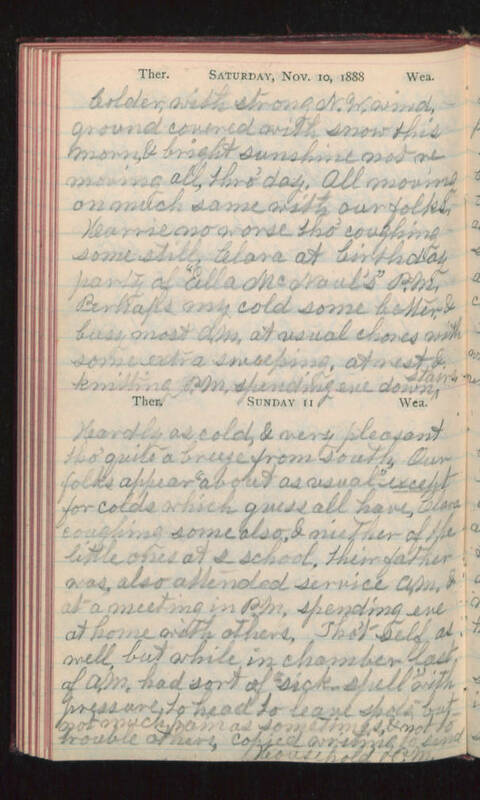 Saturday, Nov. 10, 1888 Colder, with strong N.W. wind, ground covered with snow this morn, & bright sunshine not removing all, thro' day. All moving on much same with our folks. Karrie no worse tho coughing some still, Clara at birthday party of "Ella McNaul's" P.M. Perhaps my cold some better & busy most A.M. at usual chores with some extra sweeping, at rest & knitting P.M., spending eve down stairs. Sunday 11 Hardly as cold, & very pleasant tho' quite a breeze from south. Our folks appear "about as usual" except for colds which guess all have, Clara coughing some also & neither of the little ones at s-school. Their father was, also attended service A.M. & at a meeting in P.M. spending eve at home with others. Tho't self as well, but while in chamber last of A.M. had sort of "sick spell" with pressure to head to leave spots but not much pain as sometimes & not to trouble others, copied writing to send Household P.M.